The Regal Cinema in Tenbury, Worcestershire, is to receive a grant to help conserve the Grade II building. Over £680,000 has been awarded by the Heritage Lottery Fund to fund community activities and preserve the Art Deco purpose built cinema. Designed by specialist cinema architect Ernest Robert, it is nationally recognised by the Cinema Theatre Association as having ‘one of the most astonishing auditorium decorations of 1930s cinemas in Britain’. Unlike many cinema’s of the period which have fallen into disrepair and dereliction, the construction of a community centre at the rear of the building in the 1980’s has seen the Regal Cinema act as a focal point for local groups and activities ever since. Built to replace the New Picture House, which was on the site since 1917, the Regal Cinema was acquired by the Council in 1972. Located on Teme Street in Tenbury town centre it has been cited an excellent example of a 1930s ‘super cinema’ constructed on miniature scale. 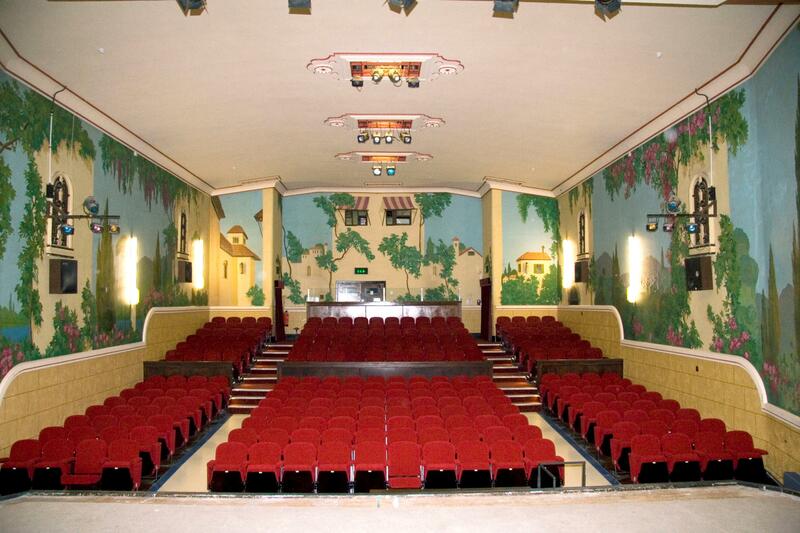 Designed by specialist cinema architect Ernest Robert, it is nationally recognised by the Cinema Theatre Association as having ‘one of the most astonishing auditorium decorations of 1930s cinemas in Britain’ in the form of a painted mural by George Legge – a ‘trompe l’oeil’ Italian scene around three sides of the interior. Currently in poor condition and suffering from water ingress through its roof and walls, the grant money will ensure that this 20th century artwork is conserved and saved for future generations. Community activities to be run in conjunction with the project include the recruitment and training of volunteers to carry out research for a booklet, oral histories to be recorded and made into a CD, cinema tours, a teacher/student resource pack called ‘Producing the Regal’, and a young people’s annual film project. The HLF grant to the project is for £681,300 (90% of project costs) and is a Heritage Lottery Fund confirmed award.